The English alternative band Muse released the track “Time is Running Out” in the United Kingdom in 2003 and the United States in 2004. The single was from their third studio released album, Absolution, but was its breakthrough hit in the United States. In the music video, the band sings on a round table as military personnel sit and dance around the table. 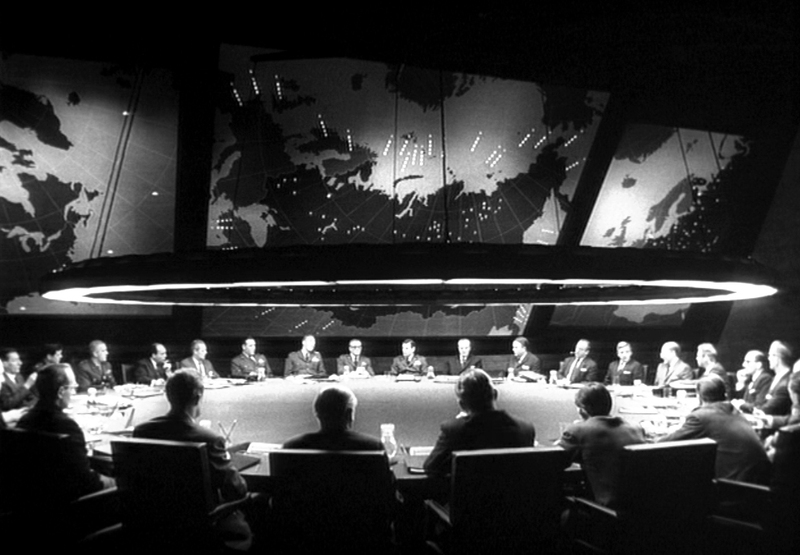 The room in the video resembles the “war room” from “Dr. Strange Love or: How I Stopped Worrying and Learned to Love the Bomb” (1964), a comedy satirizing the nuclear war scare of the 1950s and 1960s. Lead singer of Muse, Matthew Bellamy said in a 2009 interview that foreign policy books influence his lyrics. This may explain his Dr. Strangelove reference in the video. “George Orwell’s “1984,” you can hear a bit of that creeping into the album (Resistance). I read a lot of foreign policy, political think-tank type books. The Grand Chessboard, by Zbigniew Brzezinskiis a book about America’s desire for hegemonic primacy, world dominance, how they manage the Eurasian land-mass. That sort of Dr. Strangelove style thinking. I love these sort of mad thinkers,” Bellamy said. This entry was posted in Music Video Film References and tagged Doctor Strange Love, Doctor Strange Love or How I Quit Worrying and Learned to Love the Bomb, Muse, Time is Running Out by Jnpickens. Bookmark the permalink.